Outer fly: Single fold of 680 G/m2 waterproof & rot proof cotton canvas. Color Olive green (Outer Fly)Khaki (Inner Fly). Mud Flap Made of white HDPE fabric 270g/m2-20 cm on wall and 30 cm as mud flap. 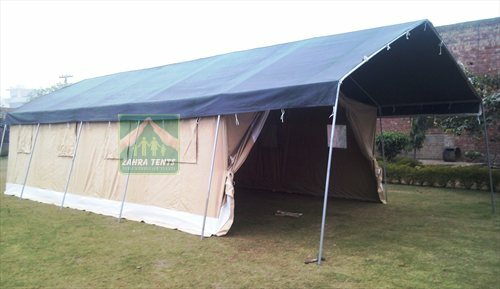 Packing Each tent packed with all accessories in one rolled bale, wrapped into polythene and then a good quality HDPE bag and then sealed by three steel straps.